Written/sketched 2003: You have to get off the Yellowhead Highway and explore along the railway tracks, about a kilometre away, to find the old parts of towns like Blue River. The Blue River store, across the road from the CN railway and the former station site, is one of the oldest, if not the oldest, commercial buildings left in the valley between Kamloops and the Rockies. 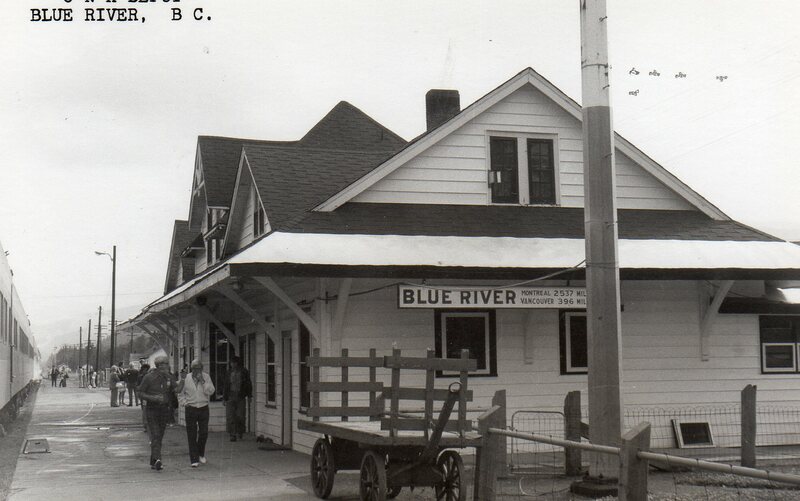 At one time Blue River was a divisional point on the mainline, there being a roundhouse across the tracks from the station and the store. The store was built in 1912 by David McLaren, whose name remains as a second line on the blue sign on the store's facade. Its large upstairs space, reached by the separate staircase with its own door on the right, has been used as a school, a public meeting hall and a boarding house or rooming house. 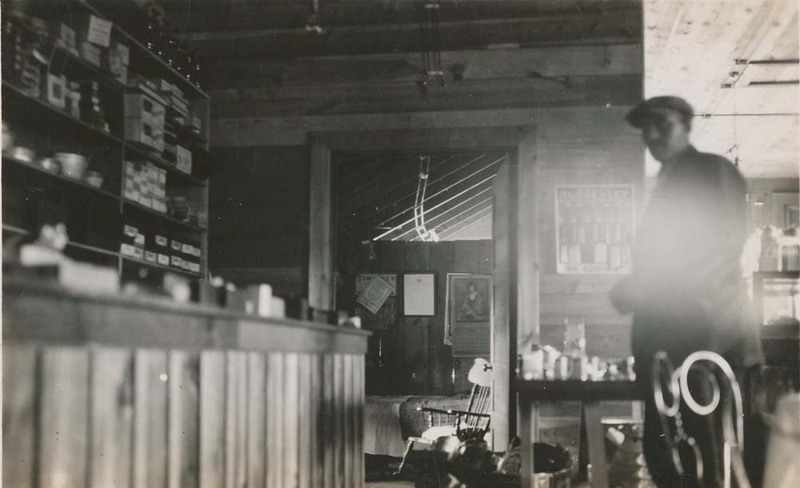 The store was also the town's postal agency. 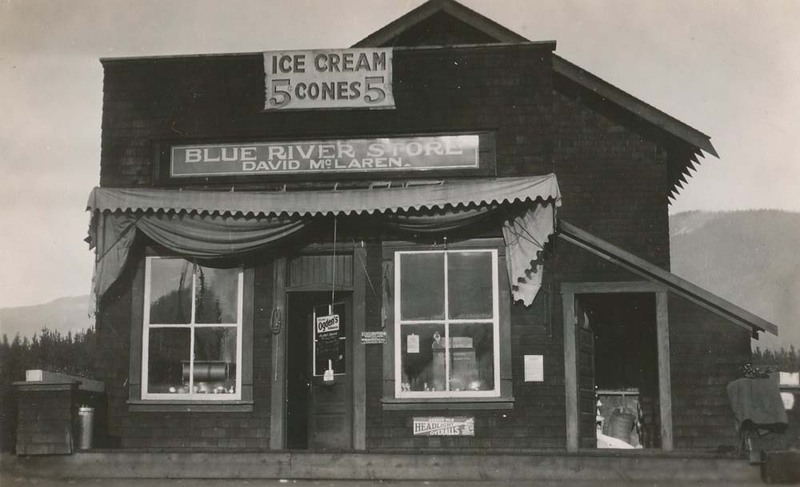 McLaren retired in 1957 and sold the store to Jim and Mary Jane Lamonte, who had come to Blue River in 1954 to run the Beanery in the CN station. (see the GTP page for a couple more stations with Beaneries that are now revived.] It is still locally known as Janie's Store due to the Lamontes' time there. Andreas Becker bought the store in 2001, and Mary Jane Lamonte died the following year, having been predeceased by her husband; he has collected the information above from locals and visitors in the past couple of years. 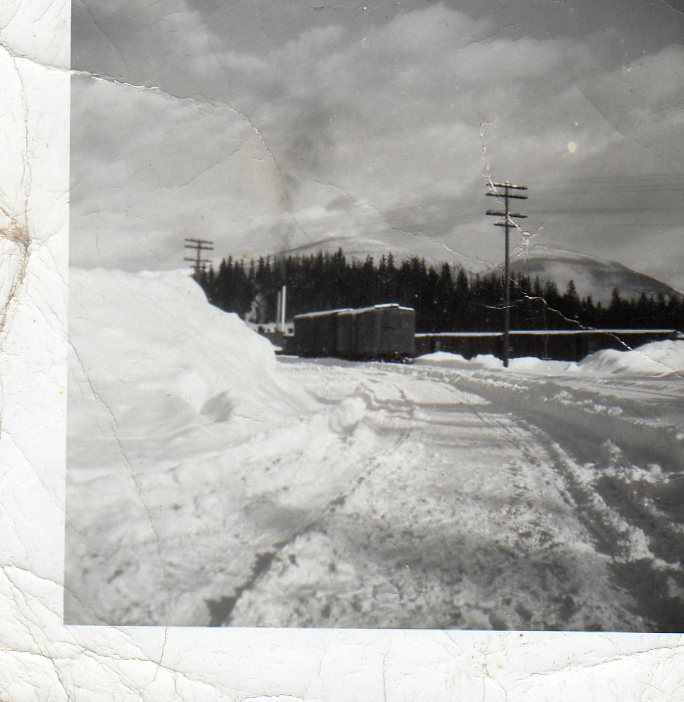 Blue River was the staging area for roadwork utilizing Japanese-Canadian men during the Second World War. See the pages on that saga beginning at Wong's Market. From Brad Ursulak, 2014: i worked in that store as kid for Jane Lamont and grew up in Blue River many good memories there went back a few years ago and its not the same my kids still live there. From Audrey and Larry Kier, 2012: Recently my father-in-law moved into a care facility and gave us all the family history he had collected, including thousands of photos, slides, negatives and extensive written accounts of many of the local pioneers. Many of the images were taken of various places throughout BC around the turn of the century and later. His father was a BC Police officer during the 20's and 30's, William Kier. 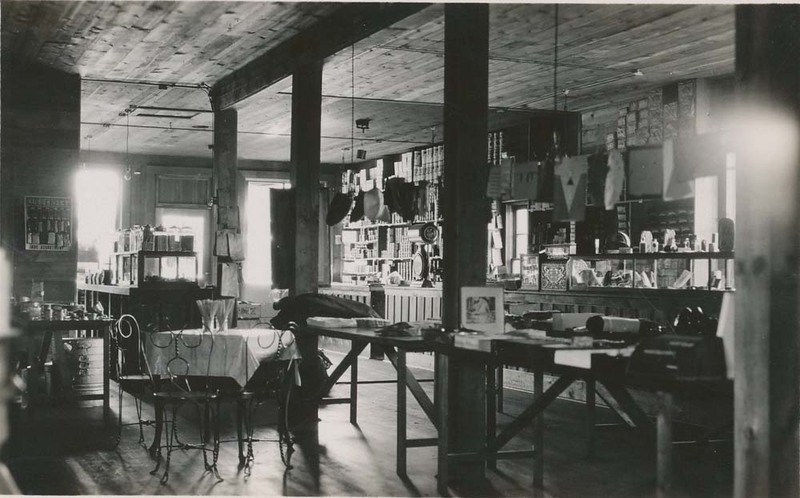 We came across 3 pictures of the Blue River Store taken in 1926. My husband and I live on southern Vancouver Island on crown pre-emption land granted to his family in the 1860's (not far from Whippletree!!). We have not visited the area around Blue River, but we plan to include a visit there soon, especially to see what is left of the Blue River Store. 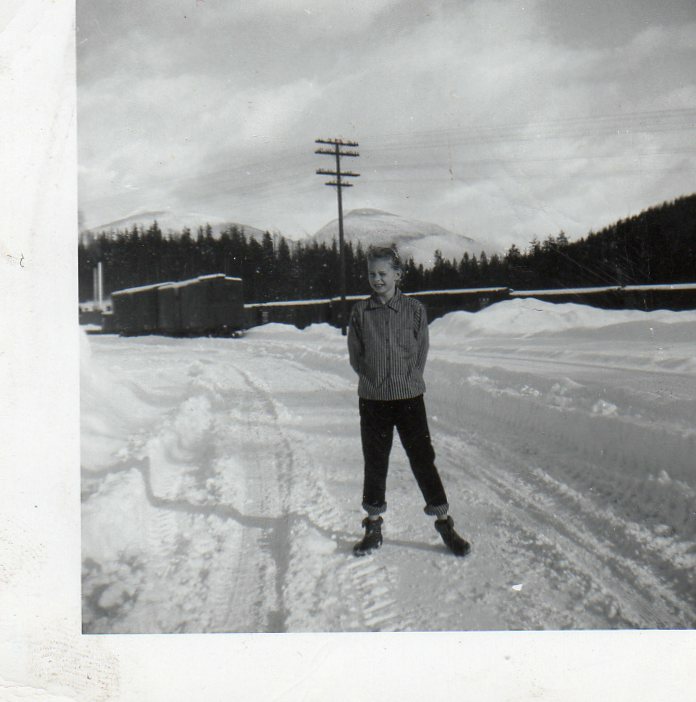 Note from Sharon Negraiff, 2010: I lived in Blue River, BC in 1957-1959, possibly earlier or a bit longer. 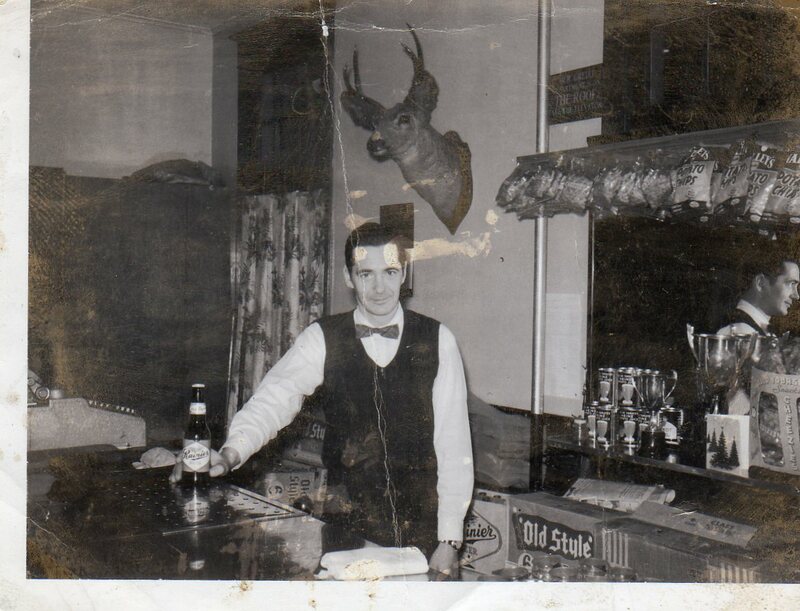 My father ran the beer parlour in the Blue River Hotel. It had a restaurant, which my mother worked in, as she was the manager. Mrs Whiteman owned the Hotel. Ethel was the cook. We used to pick the low bush blueberries, which there were plenty of and sell them to the cook for $1.00. That would allow us to go across the street to the store, which I think was called Muttitt`s, but not positive, and not sure of the spelling. It started with an M. Across the street from the store was the Post office. The garage, Petch's was on the highway, as well as one motel. From the highway, which was a dirt one, barely wide enough for one vehicle, the road came straight down past the school, the hotel and ended at the station. From there you turned right to go to Lamont's. The train station not only had a cool roundhouse that I got to go in, it also had an ice house which we played in. Lamont's General Store was down past the Railway Station My mom ran the Beanery. It was only open when the train was due to arrive. A conductor would not take my ticket the time I went by train to my aunt`s in White Rock, because "I was Betty`s daughter". He told me to cash it in. We lived down past Lamont's store on a corner right next to the railway in the last house on the street. Down towards the lake and across the tracks was where the Penecostal Church Bible Camp was each year. The same lake we all swam in with the blood suckers. Have been back a few times and at first couldn't find the house I remembered. That was because as an adult I couldn't believe how small it was!! Did find it. The present owner had built onto it! Allowed to look inside and I was awed at how tiny it was. One room! The last house we lived in had burned down. Mrs Harrison, who taught piano and gave me lessons, lived across the lake in what I perceived to be a big white house. I couldn't find it, there was just this little white building there. Things are different through the eyes of a child. Some of the people who lived in Blue River in those days were Ahenakew, Tourand, Bell, Hill, Mahar, Petch, Lamont. Mr. Palmer who was our principal and teacher. Other names will pop into my head I am sure. Note from Denise Derkson (Glen and Willow's Friend), 2009: Just saw your website byway of a google search for Janie's General Store in Blue River, BC. I'm sure you'll be happy to know, that the store is up and running since early 2005. It is owned by Glen and Willow Macdonald who have reopened the place since they completed an initial renovation in early 2005. Changes to the inside have been constant, with the most recent addition of a bank of fridges/ freezer which Glen has worked on himself. Willow has been busy too, keeping up with the "Janie's Takeout" part of the store. The locals have been enjoying her homemade soups, sandwiches and treats. An unexpected but happy affect of reopening the store is that Via Rail has taken to stopping by once or twice a week, schedule permitting, of course. So, next time you are in the area, feel free to stop by, we'd be happy to give you a cup of coffee and show off our bit of heaven. Note from Donna Gray, 2007: My father was a conductor on the CN passenger trains that stopped in Blue River from Vancouver, years ago. I travelled with him a few times back in the late fifties/early sixties when I was just a kid. We sometimes stayed in the bunkhouse and then travelled back to Vancouver the next day. I was wondering if you have any recollection of a beer parlour or pub being there or was beer served at the store? Reason being, I have come across a painting of some cows that my dad claims came from a "hotel or pub?" from Blue River. He purchased it many years ago when the place was either being renovated, sold or torn down. It is an interesting painting and we were just trying to get some history on it. If you can help us out please contact me via this website. Note from Larry Fex, 2007: I lived in Blue River from 1959 - 1975. My mother worked at the bunk house, my dad was a rail yard Foreman for CNR. Beer was not sold or supplied in the bunk house. Beer was sold and drank at the store close by and of coarse the local hotel which I think burnt down some years ago.